HTS-powercables.nl bv is a Dutch company that intends to deliver superior knowledge, experience and cost-effective solutions to clients worldwide in the field of transport of electricity. Surprisingly, these solutions are provided not only by superconducting (HTS) cables but also by evacuated tube transport (ET3). For the Netherlands, HTS-powercables.nl has ambition to bring the entire transmission network underground. In order to reach the ambitious and realistic goals and to save money for the tax-payer in the decades ahead, the management of HTS-powercables.nl b.v. will set up a platform aiming at implementing HTS power cables and including an effective lobby, influence the public opinion, supply facts, data and scientific evidence to the press and support action groups who protest against ugly and ineffective overhead lines and who clearly and wisely vote for cabling in general and turnkey-solutions by HTScables in particular. Having said that, HTS-powercables.nl seeks to position itself as a provider of turnkey solutions worldwide, not excluding any nation or tribe. We believe that receiving sustainable energy through sustainable transport is a human right for all groups of people, wherever they live. Figure 1. Future AC transmission grid of the Netherlands: the orange lines in the background are 380 kV AC (mainly overhead lines) – vision of Tennet for year 2030; the blue network- vision of the HTS-powercables.nl, the grid is based entirely on HTS cables, respectively the thicker and the thinner blue lines are 380 and 150 kV cables, the larger and the smaller circles are 380 and 150 kV HTS substations: of all 380 kV substations there are 22 backbone at 380/150 kV; the grey circles are the interconnector hubs (to which the proposed net is anchored). Proposed HTS cable network is formed by rhombi with 35 (vertical) by 35 km (horizontal) dimensions being slightly deformed to respect the country borders and the interconnector hubs, which results in about 1500 km length of the backbone. In turn, each rhomb is divided into four segments by a 150 kV network with an additional 150/50 kV node in the centre (and so on). The resulting length of the 150 kV backbone is about 750 km with 15 additional 150/50 kV nodes, attainable within 13 km distance from anywhere within the network. Superconducting power cables are (see detailed below): light, compact, economic, underground, emit no magnetic field and transport electricity with higher capacity and less energy loss while the transport through archaic aluminum and copper overhead lines and cables is so ineffective that in year 2025 with business as usual Netherlands will lose in its power grid energy equal to that produced by 1/2 of the all Dutch offshore wind power parks. HTS-powercables.nl takes the standpoint that in order to make better use of taxpayers and private money, it is wiser one quarter of the foreseen investment (into wind power parks, 80 B€) to divert into the national ET3 network that can be fully operational before year 2035. This step will speed up reaching Dutch targets of Kyoto protocol (by 10 years) and will free resources to (amongst other things with added value) entirely modernize Dutch power grid by replacing the overhead lines with underground superconductive power cables, which will transform the transmission grid from overhead into underground in economically and environmentally sustainable way. For the same current, conductors of HTS power cables are much lighter than Cu or Al conductors of overhead lines or of conventional cables, therefore lighter means can be used for their installation, speeding up the process and reducing the costs. A 380 kV overhead line, conventional or HTS cable require respectively 90, 10 or 3 m-wide right of way. At present, the initial investment and the 40-years lifetime costs of HTS transmission cable respectively are approaching and are lower than that of OHL, so that after 15 years of operation total cost of HTS cable is lower than that of OHL. Furthermore, the initial investment costs of HTS cable are lower than that of conventional cable. Assuming the whole 380 kV HTS backbone (see above) designed for N-2 contingency (available 99.9999 of the time), the initial investment and lifetime costs of 380 kV HTS backbone are (with HTS cable costs estimated from 25 and 35 B€ respectively and of the entire backbone (380 and 150 kV) are 30 and 42 B€ respectively. 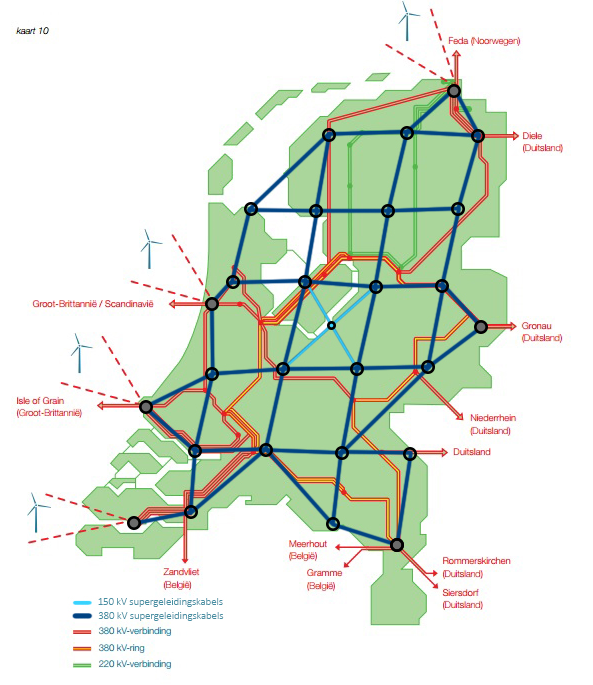 Therefore, modernising entire Dutch electricity transmission grid with HTS cables can be done within the investment allocated for wind parks. In modern high temperature superconductor current density is 200 times higher than in copper. Through the same cross-section, HTS cable can carry 5-10 times more current than conventional cable. Presently, 95% of the Dutch transmission network is made of overhead lines, cabling of the network at 50 kV is completed and at 150 kV is started. At 380 kV conventional cabling is done only occasionally, e.g. in Randstad, since this compromises stability of the grid. HTS cables will move the whole Dutch grid underground greatly improving environmental aspects. As compared to OHL and to conventional cable, HTS cable has much lower energy loss, and thus lower lifetime costs than that of OHL after 15 years of operation and than that of conventional cable immediately, since investment cost of HTS cable are lower than that of conventional cable.